I think that buttons are pretty much self explanatory, but just to be clear: first row allows to control system volume, second and third are used to control media playback, next one allows to launch application of a given type. The last row contains buttons responsible for system power control. I guess that problems with launching browser and email client may be result of system configuration. 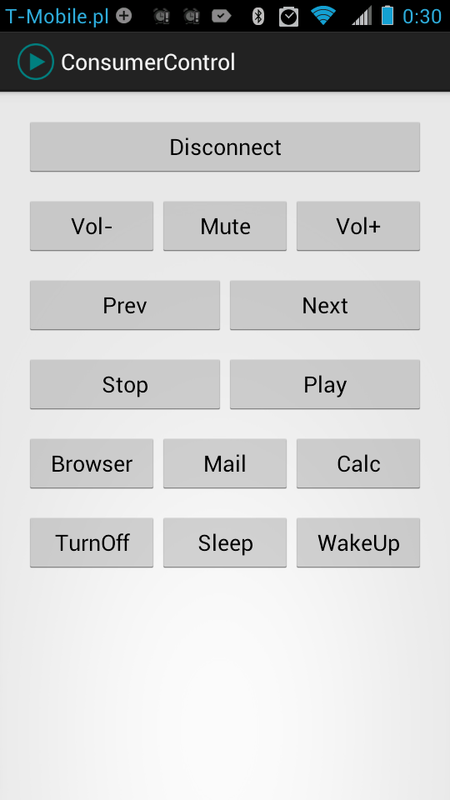 The fact that "Sleep" does not work on Android may be related to CX-01 TV stick, which I used for the test. In case of Windows XP, instead of immediately going to sleep it asks user to select action (sleep, shut down, restart). Current version of InputStick firmware does not support remote wake up, so obviously wake up does not work. So as you can see, there are some problems with Consumer Control Device class, but after all it can be used to create multimedia remote control application, which generally works on all platforms. In my case I have used it to control Winamp, Windows Media Player, Media Player Classic and VLC Player on Windows and stock media player on Android.